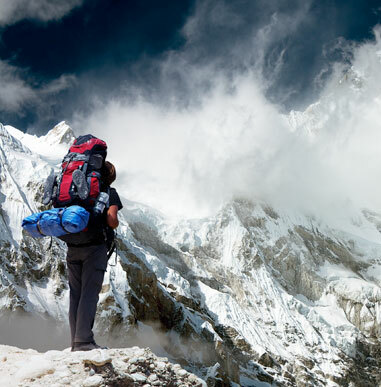 Our Cho Oyu mountain expedition begins in Kathmandu, the capital of Nepal. After touring Kathmandu and securing our Tibetan visas, we will fly to Lhasa and travel by jeep, visiting Tibetan towns and monasteries en route to Base Camp (16,400 ft.). This will give us a great introduction to the hearty people and harsh landscape of the high plateau. Once at Base Camp, we’ll meet our Tibetan yak drivers and their animals. Yaks carry our loads to Advanced Base Camp (18,500 ft.) at the foot of the famous Nangpa-La Pass. We will spend the next three or four days establishing Advanced Base Camp and making short acclimatization forays to the lower reaches of the West Ridge. 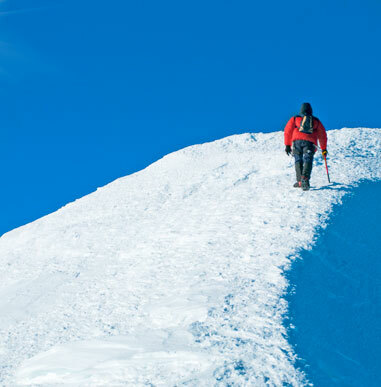 With the assistance of our Sherpa team, we’ll place Camp I (21,000 ft.) atop the West Ridge. Over the next 10 days, we’ll establish Camp II (23,100 ft.) and Camp III (24,500 ft.). We will repeatedly move up and down the mountain to enhance strong acclimatization and overall fitness. Once our last camp is set and the team has rested for a few days at Advanced Base Camp, we’ll begin the summit climb. Prior to our summit attempt, team members will spend the night at Camp III sleeping on supplemental oxygen, strengthening the body’s circulation systems. Our summit attempt begins between midnight and 1 a.m. We will climb with supplemental oxygen on summit day. From High Camp, we’ll ascend the West Face through a rock band and up snow slopes of 25 to 40 degrees to reach the West Ridge proper. 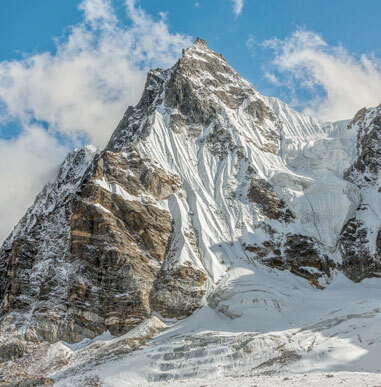 This gentle ridge leads to the large summit plateau at approximately 26,000 ft. From there, we’ll spend the next hour traveling across this plateau to reach the true summit and a spectacular 360 degree view that includes Everest, Lhotse, Ama Dablam and an array of Himalayan peaks. To the north lies the Tibetan plateau (the highest in the world), and to the south stand hundreds of Nepalese peaks. After reaching the summit, our team will descend to Camp II. It takes approximately five days to clear the mountain and move equipment back to Base Camp. Once we have arrived at Base Camp and said farewell to our Tibetan yak drivers, we’ll begin our return to Kathmandu. After arriving in Kathmandu, we’ll sort equipment and celebrate in the fascinating capital city before our international departures. A note about this itinerary: We generally complete our trip in the prescribed days, but we have built extra days here that may or may not be used. This schedule is intended to be flexible. If the road reopens we may travel overland. The Itinerary below utilizes a flight to Lhasa. Rest day/visa processing in Chinese embassy in Kathmandu. Overnight at Shigatse. Acclimatization hike. Overnight at Tingri. Acclimatization hike. Travel to Intermediate Camp (17,000 ft.) with yak support. Organize and set up camp. Climb to Camp I (21,000 ft.), return to Advanced Base Camp. Carry and sleep at Camp I. Climb to Ice Cliff and return to Camp I. Carry to Camp 1.5 (22,500 ft.). Carry to Camp II (23,400 ft.). Descend to Advanced Base Camp. Rest in Advanced Base Camp. Move to Camp III (24,800 ft.). Return to Advanced Base Camp. Trek to Intermediate Camp and drive to Tingri. Depart Kathmandu for home country. Please ensure that this departure date (Day 45) is flexible. Do not plan any important business for two weeks following the expedition, and ensure that your plane ticket is changeable.